google authorship | Digital Marketing, Poetry, Reviews, Philosophy, Sports & Tales by Joe Wooldridge. Yesterday Google announced that it was unplugging its ‘Google Authorship’ tool after a three year effort to match authors with content and apply to search. Authorship was a great idea with a lot of potential, but lack of adaptation and impact coupled with the rise of (and constraints of) mobile search led to its demise. Google found that Authorship did not have a noticeable impact on click traffic. 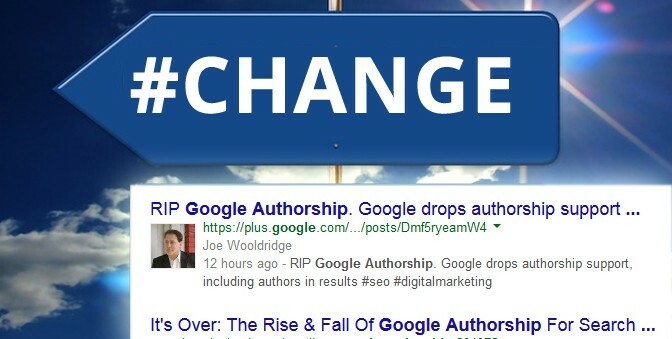 Officially announced yesterday by John Mueller (see Google+ post from Google Webmaster Tools), Google will no longer show authorship results in Google Search, and is discontinuing tracking data for any content using rel=author markup. The news has even sparked speculation and stretching that Google+ could be next on the chopping block, but don’t count on that further development. Google has a long history of rolling out new experimental products and rigorously testing them for usefulness, adoption, relevance, impact and overall value. If those products fell flat or failed to measure up, then Google has admiringly pulled the plug on them and moved forward. That approach to products and services is one of the main reasons Google has risen to the top – and also why they should continue their dominance. Chances are that Google already has there eye on a better way to achieve the goals that Authorship failed to reach – and are testing it in a super-secret lab in the mountains. Rock on Ziggy Stardust . . Changes on Youtube.